On a frigid morning in early December, a team of NASA rocket scientists will huddle in the control room in Ny-Ålesund, Svalbard, a remote archipelago off the northern coast of Norway. Here at the world's northernmost rocket range, operated by Norway's Andøya Space Center, the clock may read 8 a.m., but the Sun won't be up—by that time, it won't have peeked over the horizon in more than a month. For a month's time, Ny-Ålesund will be home to the rocket team behind NASA's VISIONS-2 mission, short for Visualizing Ion Outflow via Neutral Atom Sensing-2. They have ventured to this extreme place for an up-close look at atmospheric escape, the process whereby Earth is slowly leaking its atmosphere into space. Understanding atmospheric escape on Earth has applications all over the Universe—from predicting which far off planets might be habitable, to piecing together how Mars became the desolate, exposed landscape it is today. VISIONS-2 is scheduled to launch no earlier than Dec. 4, 2018. Led by Doug Rowland of NASA's Goddard Space Flight Center in Greenbelt, Maryland, VISIONS-2 is a sounding rocket mission, a type of suborbital rocket that makes brief, targeted flights into space before falling back to Earth just a few minutes later. 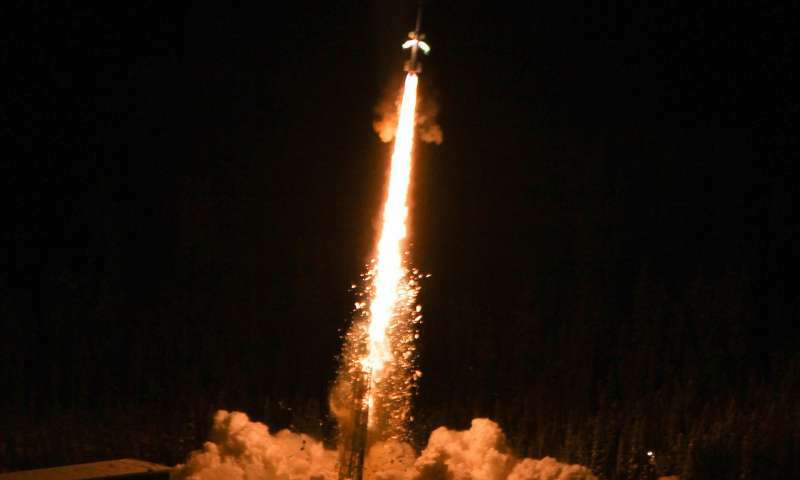 Sounding rockets are unique among scientific spacecraft for their superior dexterity: They can be carted to remote locations, where they are aimed and shot into short-lived events—like the sudden formation of the aurora borealis—at a moment's notice. The aurora borealis is of keen interest to the VISIONS-2 team, but not just for its otherworldly glow. The aurora play are fundamental drivers in the process of atmospheric escape, whereby planets, including Earth, gradually leak their atmosphere into space. "The Earth is losing weight," said Thomas Moore, a Goddard space physicist who specializes in atmospheric escape. "There have been enough observations to know that anywhere from a hundred to several hundred tons of atmosphere are going into space every day." We've suspected that Earth was losing atmosphere since at least 1904, when Sir James Jeans first published his work The Dynamical Theory of Gases, laying the theoretical foundations for atmospheric escape. But there's one element draining away that still presents a mystery. Scientists had long thought that oxygen, weighing in at 16 times the mass of hydrogen, was too heavy to escape Earth's gravity. "To escape Earth, oxygen would require something like 100 times the energy that it typically has," said Rowland, the mission's principal investigator. "Only the tiniest fraction should ever make it." But when scientists finally went up and looked in the '60s and '70s, that's not what they found. In fact, near-Earth space is teeming with much more Earth-borne oxygen than anyone had expected. "But how did it get up there? You need processes that energize that oxygen enough to escape," said Rowland. The aurora, it turns out, is one such process. The aurora are formed when energetic electrons, accelerated in the electric and magnetic fields in near-Earth space, crash into and excite atmospheric gases, which emit bright hues of red, green, and yellow as they relax back to a lower energy state. 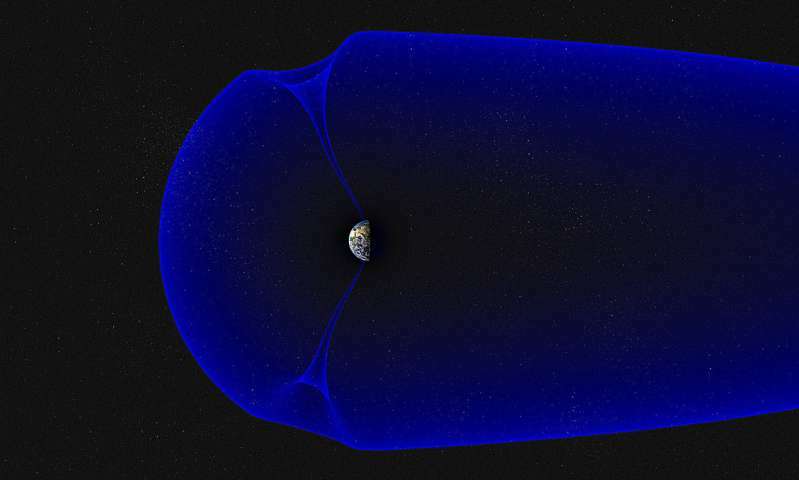 But these unruly electrons also create a cascade of havoc in the process, including driving electric currents that heat the upper atmosphere in splotchy patches. In some cases, that heating is sufficient to give stray oxygen atoms enough energy to escape. "It's like putting a heating element into your soup—eventually, it's going to start boiling," said Rowland. 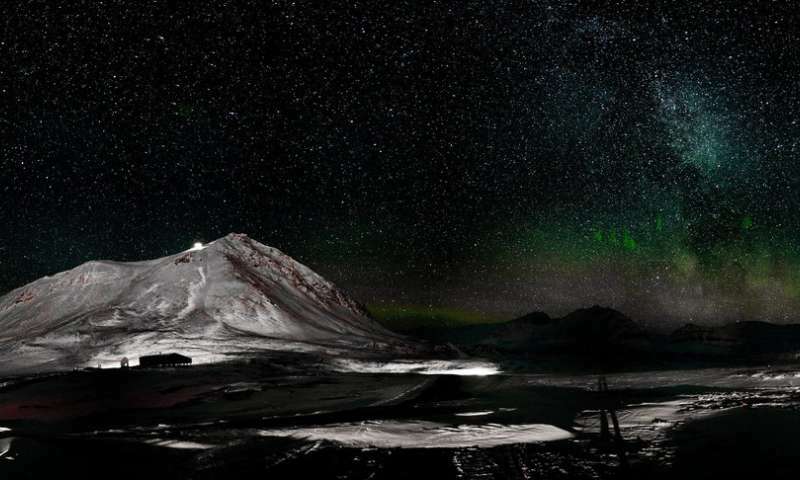 VISIONS-1, the current mission's precursor, launched from the Poker Flat Research Range in Alaska in 2013, where they studied oxygen outflow from aurora that form on Earth's night side, the part of the planet that is temporarily pointed away from the Sun. For the VISIONS-2 mission, the team will travel to a unique part of the globe where dayside aurora can be found. Once a day, Svalbard passes under an unusual feature in Earth's magnetosphere known as the polar cusp. The polar cusps form at both the North and South poles on the Sun-facing side of the planet, and they are the only places where particles from the solar wind can stream directly into our atmosphere. The cusps are like magnetic bridges between Earth and space, where energetic electrons from the Sun crash into atmospheric particles and create a dayside aurora. VISIONS-2 will fly two rockets into the northern polar cusp, where it will use an imaging technique to map oxygen outflow from the aurora. Using this technique, VISIONS-2 takes a different approach from many other missions, which attempt to combine data from many outflow events. Instead, VISIONS-2 hopes to acquire a great deal of data about a single oxygen outflow event. Not all outflow events are the same, but understanding one in great detail would provide significant scientific value. "It's like if you're trying to study tornados, you could just measure the winds as various tornadoes fly by at different distances from your house," said Rowland. "You'd get a picture of what an 'average' tornado looks like. What we want to do instead is to comprehensively observe one tornado, to understand how it works in detail." VISIONS-2 is all about checking whether and how the process for the heating and energizing of oxygen on the dayside aurora—within the polar cusp—is the same as those discovered on the night side. It's far from a foregone conclusion, as the dayside and nightside display some marked differences. "The ion outflow in the cusp is more steady and lower energy, while that in the nightside is more bursty and can be higher energy," Rowland explained. "In addition, the environment is different between the cusp and nightside, so we're looking for commonalities and differences." VISIONS-2 won't be the only rocket to launch from this remote location: It is the first of nine sounding rockets launching over the next 14 months as part of the Grand Challenge Initiative—Cusp. Drawing researchers from the United States, Canada, Norway, the UK and Japan, the Grand Challenge is an international collaboration to explore the northern polar cusp, hopefully cracking the code of this unusual portal between Earth and space. VISIONS-2 is scheduled to launch from Ny-Ålesund, Svalbard rocket range in December 2018. The launch window extends from December 4 through 18.